Why wait for a special occasion to enjoy creamy spinach artichoke dip and yummy stuffed mushrooms? 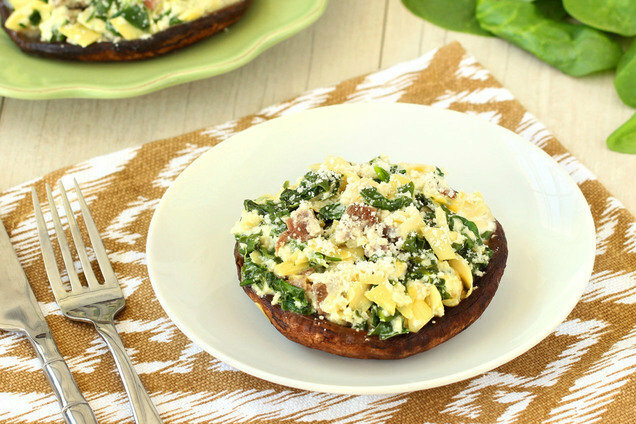 These mega mushrooms are packed with a savory filling inspired by the party dip... YUM! Preheat oven to 400 degrees. Lay a large piece of heavy-duty foil on a baking sheet, and spray with nonstick spray. Remove mushroom stems, chop, and set aside. Place mushroom caps on the center of the foil, rounded sides down. Top with another large piece of foil. Fold together and seal all four edges of the two foil pieces, forming a well-sealed packet. Bake for 14 minutes, or until mushroom caps are tender. Meanwhile, prepare filling. Bring a large skillet sprayed with nonstick spray to medium heat. Add chopped mushroom stems, spinach, artichoke hearts, garlic, salt, and pepper. Cook and stir until spinach has wilted, about 2 minutes. Reduce heat to medium low. Add mozzarella, yogurt, and 1 tsp. Parm. Cook and stir until hot and well mixed, about 1 minute. Cut foil packet to release steam before opening entirely. Plate mushrooms, and blot dry. Add filling, and sprinkle with remaining 1 tsp. Parm. This dish is too good to keep to yourself! Click "Send to a Friend" now!